BSNLEU CHQ has given some information about the latest position with regard to wage revision in BSNL. Neither NFTE nor the SNEA website shows anything till 1200 hours on today, 15-2-2019. According to BSNLEU Website, the Management offers wage revision with ZERO Percent benefit immediately; thereafter Minister will go to cabinet for approval to grant 5%. Union now demands minimum benefit of 10% fitment. Even if there is any agreement on 0% or 5% or 10% (I wish them the best) that has no impact on our pension revision. Nothing will come automatically to us. DoT will take time and go to cabinet for pension revision. If any understanding is reached with AUAB on fitment benefit in wage revision that will be used against us. Legally it is not binding on us. Pensioners are not party to the understanding on wage revision. A Company may give wage increase based on its affordability. Government cannot be led by that formula. The Govt is not under BSNL. We are covered by CCS Pension Rule 1972. PRC report or any formula suggested by PRC is not applicable to those covered by CCS Pension Rule 1972. 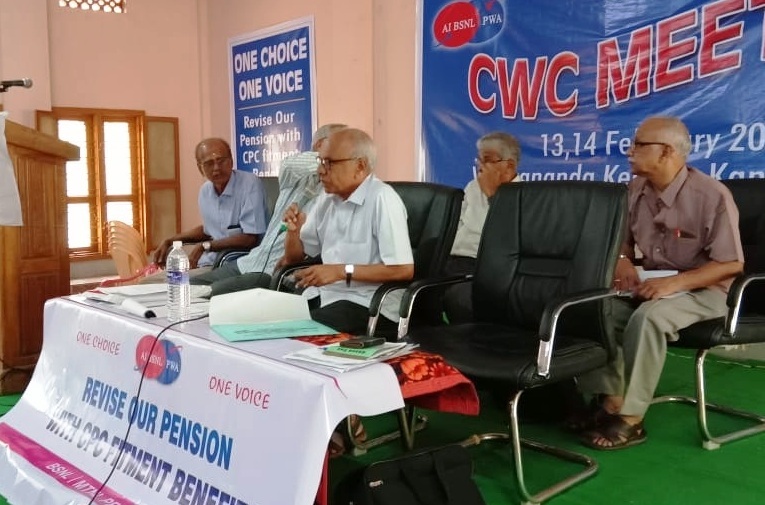 So, as decided by Kanyakumari CWC, we shall continue our efforts more vigorously to realize our just demand for PENSION REVISION WITH CPC FITMENT BENEFIT as granted to all others covered by the CCS Pension Rule of 1972. 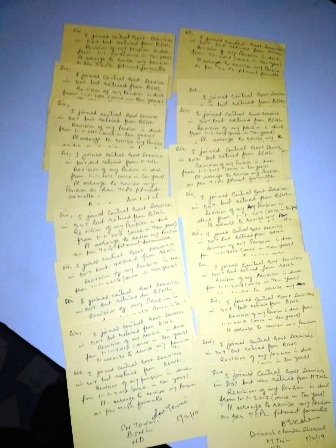 As per the feedback received from Circles our branches have sent thousands of Post Cards to Hon'ble Prime Minister demanding pension revision with CPC fitment benefits. FINAL FIGURES ARE NOT YET RECEIVED FROM TAMILNADU FROM WHERE MORE THAN 8000 CARDS ARE EXPECTED TO BE DESPATCHED. SIMILARLY MTNL MUMBAI HAS NOT COMPLETED THE WORK DUE TO SOME INCONVENIENCES. IT IS STILL GOING ON. CONSOLIDATED FIGURES HAVE NOT YET BEEN RECEIVED FROM ASSAM, HARYANA, JHARKHAND, KOLKATA AND UP EAST CIRCLES. FOR PENSION REVISION WITH CPC FITMENT BENEFITS. AIRBSNLEWA COMRADES OF HYDERABAD MET MINISTER SHRI RAVI SHANKAR PRASAD AND SUBMITTED MEMORANDUM. SALEM WEST BRANCH LEADERS MET SHRI V PANNEERSELVAM M P AND SUBMITTED MEMORANDUM. ALL THE ABOVE POLITICAL LEADERS ASSURED SUPPORT . WE SHOULD CONTINUE THE EFFORTS ALL OVER INDIA. THE STRUGGLE SHOULD GO ON …. Yes, they were forced to state so. We are not controlled by any political party. We are not against any political party. But, our members will take political decision when election comes. Some senior officers in Sanchar Bhavan are against pensioners.They must understand that when these pensioners were in service, the Telecom Department flourished. When we were in service the BSNL earned profit of Rs 10,000 Crore even. Such people are given the worst treatment by the present officers.I hope that the GOD will not allow these officers retire from service. Otherwise, they will get worse treatment from their juniors. There is a saying in English that “Every Dog has his Day”. The Fast on 22-11-2018 was a great success. 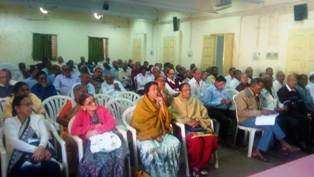 The Post Card campaign shows that more than 30,000 pensioners expressed their concern. 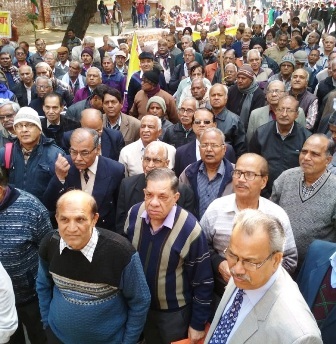 The Rally on 8-2-2019 has shown that the Pensioners are retired but not tired. There is fire in our heart still to fight for rights.We shall continue our struggle. We keep the powder dry. Now, I personally feel that we should keep the memorandum ready always and submit to the PM Shri. Modiji wherever he goes. The PM will be visiting maximum places before election. Please catch hold of some leader of BJP and try to submit a copy of the memorandum (already uploaded in our website and whatsapp) to Shri. Modiji..
…. 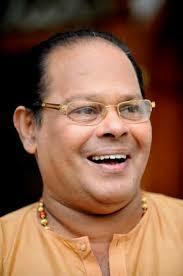 P S Ramankutty …. At the outset, we beg apology for encroaching upon your valuable time meant for most important issues of national interest. But we are constrained to approach you, sir, as head of the establishment and sympathetic towards pensioners/senior citizens, as we don’t have any other option left. We represent the erstwhile DOT employees who were absorbed in BSNL and MTNL on their formation and since retired from the service of BSNL/MTNL and entitled to Government pension (combined service) under Rule 37 A of CCS Pension Rules, 1972, as amended from time. Our pension is derived on the basis of last pay drawn on our IDA Pay Scales as per Rule 33 of the said rule.Though the chairman of seventh CPC Justice A.K.Mathur was very considerate during the oral evidence and he even told that there is a prima-facie in the demand.But it could not be incorporated in the recommendations because DoT delayed its reply to seventh CPC for 8 months on this demand (December 14 to August 15). The third PRC (for that matter no PRC) did not have ‘pension revision’ in terms of reference.Though DoT tried its best to include, DPE refused to agree based on policy decision.Thus our pension has not yet been revised whereas more than 60 lakhs Govt. Pensioners got pension revision w.e.f. 1/1/2016. We got pension revision in 2007 and after 10 years we are asking for revision.We have taken up this matter with DOT. The senior officers of DOT are of the opinion that unless pay revision takes place in BSNL/MTNL, pension revision is not possible. 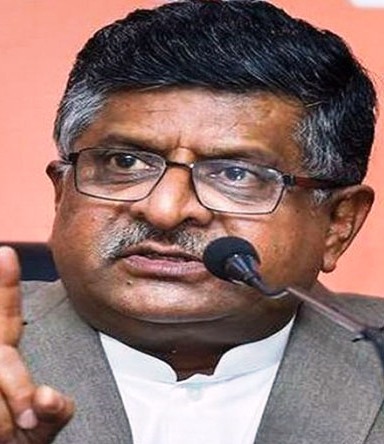 The pay revision is not being done in BSNL/MTNL due to restrictions imposed by the affordability Clause of 3rd PRC recommendations as accepted and notified by the Govt. of India. 100% liability of paying pension/family pension lies with GoI and BSNL/MTNL do not have any role in this matter.Therefore, we have pleaded to delink the issue of pension revision from pay revision. Hon’ble Minister of State ( C ),I/C was kind enough to assure that this matter will be sorted out in consultation with DOP&PW. But assurance of Hon’ble MOSC was made futile by the DOT officials by sending an inappropriate, half-baked proposal to DOP&PW. We call the DOT’s reference to DOP&PW on this matter as inappropriate because, DOT’s proposal is made deliberately short of compliance with the requirements of DOP&PW. DOP&PW has clearly stated that let DOT state how do they carry out pension revision after delinking from pay revision so that DOP&PW can examine the proposal in its entirety. DOT refuses to do so and sticks to its earlier position that pension revision is possible only after pay revision. Thus the assurance of Hon’ble MOSC has been made frustrated without even consulting DOP&PW appropriately and effectively. 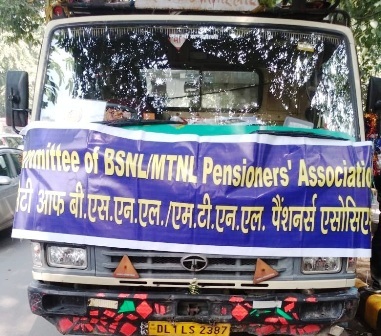 2) The BSNL/MTNL pensioners (combined service) are presently getting all pensionary benefits as per seventh CPC recommendations, accepted and notified by Govt. of India. Only pension revision is left to be done. Thus you may kindly see that even the assurance of Hon’ble MOSC has been made futile, Therefore, having no other option left, we appeal to you, sir for your kind intervention in this matter and ensure that this lot of senior citizens get due justice by way of ensuring the revision of their pension. Smt ArunaSundararajan, Secretary (T), Ministry of Communication. THOUGH BELATED, TODAY WE HAVE RECEIVED THE SAD NEWS ABOUT DEMISE OF SMT. RAJASHREE CHAUHAN, WIFE OF COM. B P S CHAUHAN, CIRCLE SECRETARY, CHHATISGARH AT BILASPUR AT 10.30 PM ON 31-1-2019. SHE WAS IN THE HOSPITAL FOR ABOUT 40 DAYS. WE CONVEY OUR HEARTFELT CONDOLENCES TO CHAUHAN FAMILY. Treasurer: Com. H C DAS. 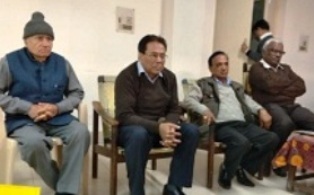 Comrades A K Singh (CS), S R Sinha (ACS), and H N Singh (DS Patna) attended the formation meeting at Samastipur,. CHQ WELCOMES THE NEW BRANCHES. This is about arrangements for CWC. Yesterday, on 5-2-2019, I visited Kanyakumari.Com. Chellaih, DS of our Nagercoil and 6 other comrades were also there. NO MORE ROOMs: We have booked 20 double-bed rooms for 12-2-2019 and 29 double-bed rooms from 13, February morning to 16, February morning, in Vivekananda Kendra. All are same type and Non AC rooms. Vivekananda Kendra is just 10 minutes walk from Kanyakumari Railway Station. As you know, Kanyakumari is the south end (last) station of Indian railways. It is a small station with big compound. Prime Minister is visiting Kanyakumari on 19-2-19 and some other conferences are also there in Vivekananda Kendra. Hence there are no more rooms available. Any one (other than CWC members and spouses, already intimated) coming has to make his/her own arrangement for stay and food. The check in time in Vivekananda Kendra is 8 AM. As such, rooms are available only from 8 AM on 12, February. Some 13 or 14 comrades are reaching Kanyakumari at 6.15 AM on 12..2.2019. They have to wait up to 8 AM or they can go to P S R Bhavan, run by PSR Anjaneyulu Memorial Trust, take bath etc. and then shift to Vivekananda Kendra after 8 AM. It is 1.5 KMs away from the Railway Station. Few volunteer comrades will be available at Railway Station from 6 AM on 12, FEbruary. Gujarat comrades (2) are reaching at 4 AM on 12-2-2019. They may please take a three wheeler and go to PSR Bhavan or wait in railway station up to 6 AM so that some volunteers can assist them. 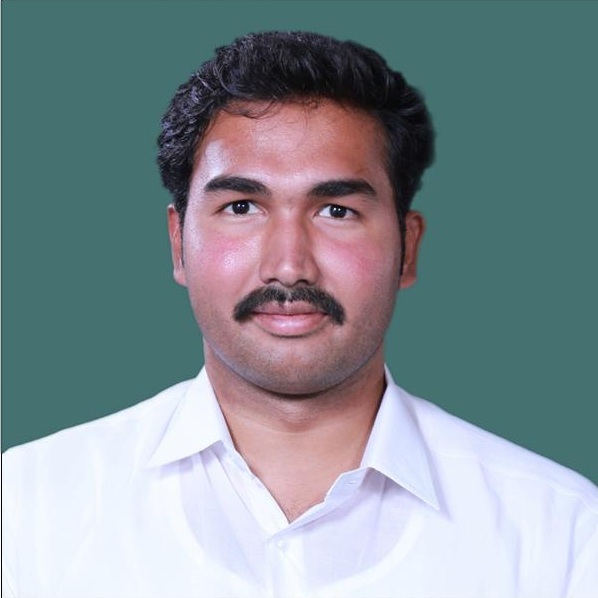 I will be in PSR Bhavan. 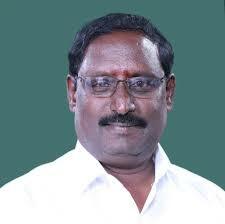 They can contact me over phone on reaching Kanyakumari. DOT CREATES CRISIS IN BSNL ? During our Services, we had seen that officers come to the negotiation tables with clear understanding of the issues and with clear decisions. If they offered something it was authoritative. On 30th January 2019, the DoT officers offered pay revision to BSNL staff with 5% fitment benefit. Very next day same officers told that even 5% is difficult. Ultimately, forced to the wall, the Staff Unions have served notice for three days strike from 18-2-2019. (1)Implementation of 3rd Pay Revision with 15% fitment. (2)Allotment of 4G spectrum to BSNL, as per the proposals submitted by the BSNL Management. (3)Implement assurance of the Hon Minister of State for Communications for delinking pension revision from pay revision. Revise pension of BSNL retirees w.e.f. 01.01.2017. (4)Payment of pension contribution by BSNL as per the Government rule. (5)Settlement of the left out issues of the 2nd Pay Revision Committee. (7) (a) Ensure financial viability of BSNL, as per the decision taken by the Group of Ministers, at the time of formation of BSNL. (b) Issue letter of comfort for BSNL’s proposals for taking bank loans. (8)Scrap BSNLs outsourcing for the operation and maintenance of its mobile towers. EVEN THAT 5% NOT POSSIBLE FOR PAY REVISION? AUAB meeting taking place tomorrow - Keep ready for the struggle. THE ALL INDIA CONSUMER PRICE INDEX FOR DECEMBER 2018 IS ANNOUNCED AS 301 POINT. AS SUCH, THE RATE OF CDA WILL INCREASE FROM EXISTING 9% TO 12% WITH EFFECT FROM JANUARY 2019. THE MATTER IN HINDI IS GIVEN IN WHATSAPP GROUP. I TRIED BUT COULD NOT UPLOAD THE SAME IN THIS WEBSITE. MAY BE BECAUSE THE FONT IS NOT AVAILABLE IN MY SYSTEM. AUAB protests deviation from the assurance given by the Hon'ble MoS(C) on delinking Pension Revision from Pay Revision. In the meeting held on 03.12.2018, between the Hon’ble Minister of State for Communications and AUAB, it was assured that pension revision would be de-linked from pay revision. 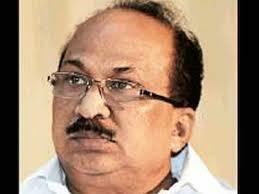 However, the officers sitting in DoT are trying to deviate from the assurance given by the Hon’ble MoS(C). For example, in the letter written by the DoT, to the Department of Pension and Pensioners Welfare, the decision of Hon’ble MoS(C) was diluted. In that letter, the DoT had asked the DoP&PW, whether pension revision can be de-linked from pay revision. In yesterday’s meeting with the Additional Secretary also, the DDG(Estt. ), DoT, was arguing that pension revision would be done only after pay revision is done. The representatives of the AUAB strongly protested this dilution and demanded that the assurance given by the Hon’ble MoS(C) should be implemented. On hearing both the arguments, the AS(T) directed that the AUAB and the DDG(Estt.) DoT, should hold further discussion on this issue. Accordingly, further discussion took place yesterday, between the representatives of the AUAB and Shri S.K. 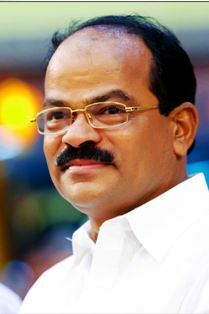 Jain, DDG(Estt. ), DoT. The AUAB categorically told that the decision of the Hon’ble MoS(C) that pension revision would be de-linked from pay revision should be implemented. 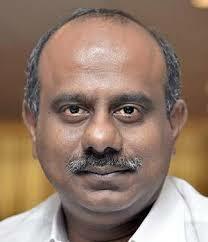 After observing the stiff resistance against dilution of the Hon’ble MoS(C)’s decision, the DDG(Estt.) assured that the issue would be further discussed with the AS(T). Please see the two attachments given below. Today, the Convener and other members of CBMPA met Additional Secretary, Telecom Mr.Anshu Prakash and discussed about Pension revision. The result is not encouraging; rather most disappointing. 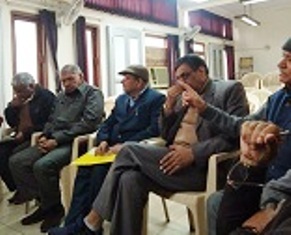 Committee of BSNL/MTNL Pensioners’ Associations met in a crucial meeting at Delhi on 29/01/2019 to review the status of our demand of Revision of Pension in BSNL and MTNL with Seventh CPC fitment and chalk out further courses of action thereto. 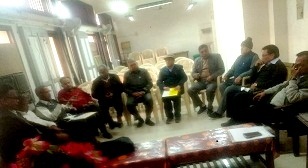 S/Shri Rajendra Prasad, Prahlad Rai, Kisan Singh, Anupam Kaul, M.K.Bagchi, S.S.Nanda, R.K.Mudgal, K.Jawahar, Badri Pathak, J.S.Yadav, Kishor Haldankar,and R.P.Sharma. At the outset, Convenor thanked all members for attending this meeting with short notice. He recalled that the first meeting of CBMPA was held on 21/11/2018 in Delhi. Within this short intervening period there have been lots of developments and hectic persuasions at various levels. But still we have miles to go to reach the goal, thanks to the reluctant and negative attitudes of some important officers in DOT. All members have taken active participation in the discussion. 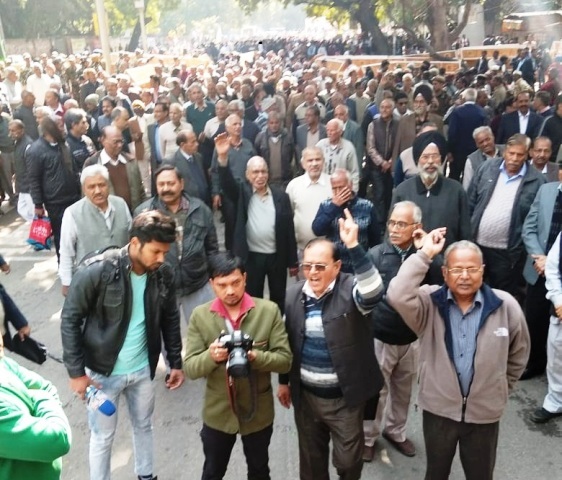 Among various opinions / observations expressed, one point has emerged as common and that is DOT is not alive to the assurance given by MOSC regarding delinking the Revision of Pension from Revision of Pay. It is clearly apparent that even the positive and proactive approach of DOP&PW is blunted by the inept handling of the issue by the concerned officers of DOT. 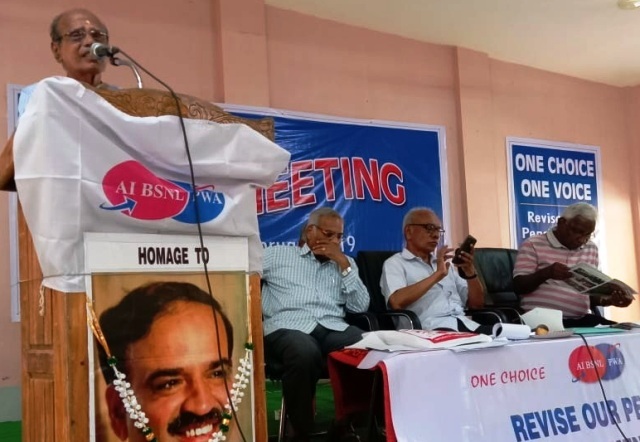 CBMPA has noted with satisfaction that AUAB and their agitation has highlighted the issue of pension revision among other matters and hoped that they would continue to do so in future. 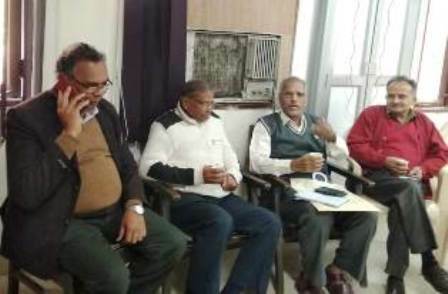 Decisions taken in the meeting of CBMPA held at Delhi on 29/1/2019. 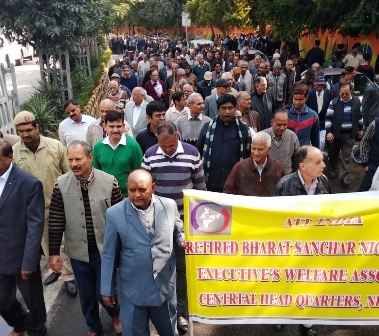 1) Convenor and other members will approach the AUAB leaders and request them to strongly persuade with Additional Secretary (T) in the meeting to be held on 30/1/2019 for implementing the Policy Decision taken by MOSC to de-link pension revision from pay revision by resubmitting the file with a concrete and comprehensive proposal to DOP&PW. 3) Post Card campaign to Shri Narendra Modi, Ho’ble Prime Minister from 4/2/2019 to 9/2/2019 by every pensioner of BSNL and MTNL on the issue of revision of Govt Pension in BSNL/MTNL. 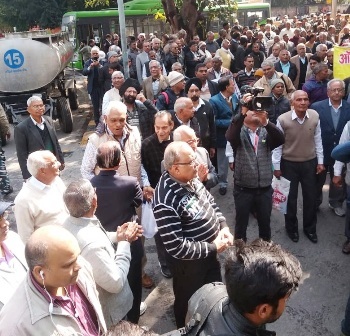 4) A Massive Rally shall be organized at Delhi from BSNL Corporate Office to Sanchar Bhawan on 08/02/2019 (Friday) and submit Memorandum to MOSC/Secretary (T). 5) A suitably drafted letter should be addressed to Hon’ble Prime Minister highlighting the failure on the part of MOSC in dealing with the Pension Revision case as assured. 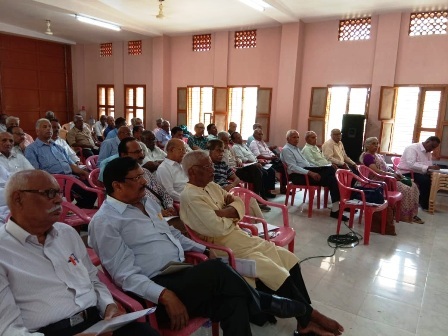 6) CBMPA expresses happiness to learn that DOT-BSNL Pensioners’ Association, Kerala has joined as Eighth constituent and has whole-heartedly welcomed this important development at this crucial juncture. 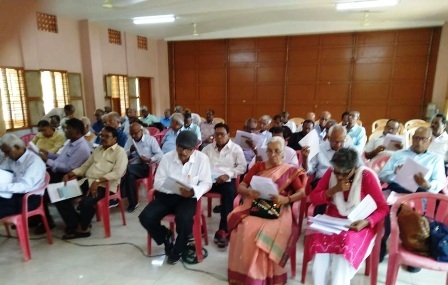 Convener and other members shall meet Secretary (T)/AST and present our case of Pension Revision with 7th CPC fitment and request DOT to send back the file to DOP&PW accordingly at the earliest. © 2015. 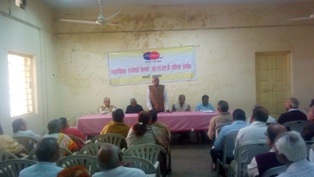 All India BSNL Pensioners’ Welfare Association. All Rights are Reserved.